The Auslan Picture Dictionary LABEL THE SIGNS e-book is an addition to The Auslan Picture Dictionary e-book and is divided into two sections of ready-made sheets - one for tracing the labels underneath each sign, and the other includes blank underlines for labelling under each sign. It is also a wonderful resource especially for deaf students who are learning English and need to memorise English words. The tracing and labelling sheets are suitable for Prep to Grade 6 students who are learning the signs for the first time. 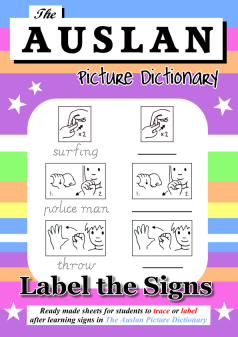 The Auslan Picture Dictionary LABEL THE SIGNS e-book is copyright and for personal and school classroom use only. The e-book is to be printed only once its entirety per individual/teacher and the individual/teacher may photocopy the e-book as many times for personal and classroom use. Please do not photocopy or reprint the e-book to be distributed to other individuals or teachers, please direct them to this website instead.